So Chinese New Year celebrations were brilliant. In fact, gatherings with friends and family are still ongoing and this weekend will continue to be a busy affair of visiting houses and crazy games. As usual I have quite a bit of backlog of photos to clear. 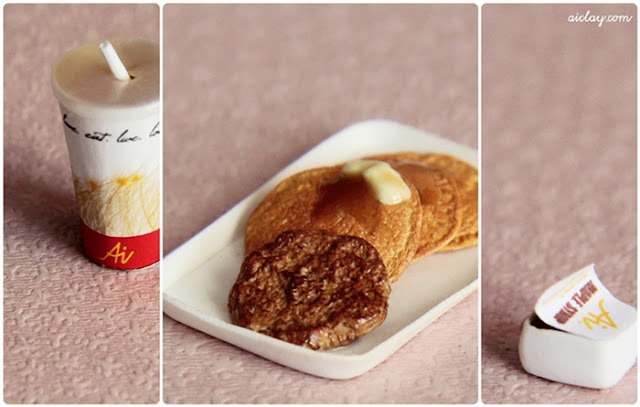 A few weeks ago, I handsculpted this miniature pancakes set, complete with a grilled sausage and orange juice on the side. Oh, and a little container of maple syrup of course. That's the little joys in designing your own packaging, you get to write all sorts of nonsense that most people wouldn't bother to read except yourself. Have I ever lamented on how much I hate taking shots of miniatures on my hand? It is a terrible struggle for me, to balance the heavy DSLR on one hand and keep my other hand from shaking. I need to get a tripod pronto. I am about 6 hours away from breakfast, sadly it wouldn't be a sumptuous feast of pancakes though. P.S Workshop information up next, psst keep 19th February free! Wow. Your attention to detail is AMAZING!!! They look real! o_o Amazing work! Lol I know how having a heavy DSLR feels. Mine's an old Canon 30D and it's ridiculously heavy especially with the macro lens. Dearest sweet Jocelyn, your work is just beautiful and this set is just perfect! So glad i found you from flickr! Love your dolls and work. Have a lovely merry happy day and love ot you! thanks everyone!! ♥ all of your sweet comments mean so much to me, and is always a great mood lifter!